Academic Calendar - list of courses offered, admission requirements, degree requirements, and university regulations. Summer research awards provide paid employment opportunities for students to participate in scientific research at Dalhousie during the summer. If you would like to gain research experience in an academic setting, these awards can provide you with financial support. The following supervisors will be offering NSERC USRA projects in Oceanography for Summer 2019. Below is a list of projects to which students can apply. Any interested students should contact the listed supervisor. Those wishing to apply for one of the following NSERC USRA projects should submit the following to the project supervisor: your CV; a brief statement of interest (which outlines your area of academic interest as well as past education and/or employment experiences that would contribute to your work on the research project); and official transcripts from all previously attended universities. The deadline for applications is Monday, January 28, 2019. Registered (at the time you apply) as a full-time student in a Science program. Cumulative grade of A - or better over the previous years of study. Have completed (by May) the course requirements for at least the first 2 years of university study. Available for full-time employment in scientific research activities during tenure of the award. Project title: Quantifying the influence of microbial fuel cells on sediment biogeochemistry. Project description: Sediment microbial fuel cells (MFC) are devices that convert chemical energy to electrical energy through the action of microbes living in anoxic sediments and can have a significant influence on sediment geochemistry. In this project the student will be involved in the deployment of a sediment microbial fuel cell in a coastal estuary and will study the influence of the MFC on the biogeochemical cycling of carbon and nutrients. The project will involve collecting sediment cores in the vicinity of the microbial fuel cell, analyzing the sediment carbon content and porewater chemistry, and relating it to the operation of the MFC. Expected skills to be acquired: Skills to be acquired will included, computer programming (R and python), techniques associated with sediment sampling, and laboratory skills associated with characterizing sediment organic matter content and porewater chemistry. In addition, the student will gain exposure to a variety of diverse scientific fields, such as biogeochemistry, electronics, and microbial ecology. Project title: Underwater acoustic propagation through a turbulent, shallow water tidal passage. Project description: Tidal passages in the Bay of Fundy are characterized by high flow speeds, large tidal ranges, and turbulent flow. In order to capture these effects on underwater sound transmission, a stochastic acoustic propagation model will be developed and calibrated against data collected in Grand Passage, Nova Scotia. Expected skills to be acquired: The student will acquire skills in acoustic propagation simulation, acoustic data analysis, turbulence, and oceanographic field measurements. Project title: Elemental characterization of key arctic phytoplankton species. Project description: The Arctic is undergoing rapid and dramatic change. The goal of this project is to determine the elemental and macromolecular composition of three arctic phytoplankton species (a diatom, a prasinophyte and a cryptophyte) under typical environmental conditions and under environmental conditions expected with further warming over the next century. Expected skills to be acquired: Laboratory skills, cell culture techniques, CHN analysis, particulate phosphorus analysis, macromolecular analyses, statistical analyses, scientific writing. Project title: Oceans and global change. Project description: The ocean initiates, amplifies and mediates global climate change on time-scales ranging from less than a year to thousands of years. Understanding the ocean’s past variability - recorded in the sedimentary archive - is thus of paramount importance for climate science. Expected skills to be acquired: Students in my lab get to use different analytical techniques to extract from the sedimentary record detailed information on the ocean of the past. See www.oceanbiogeochem-atdal.org for more. Project title: Carbon Fluxes in Bedford Basin, Nova Scotia. Project description: The transport of carbon from surface waters to the seafloor is a key mechanism of carbon burial, yet direct measurements coupling carbon fluxes to accumulation in the sediment remain a challenge in coastal areas. 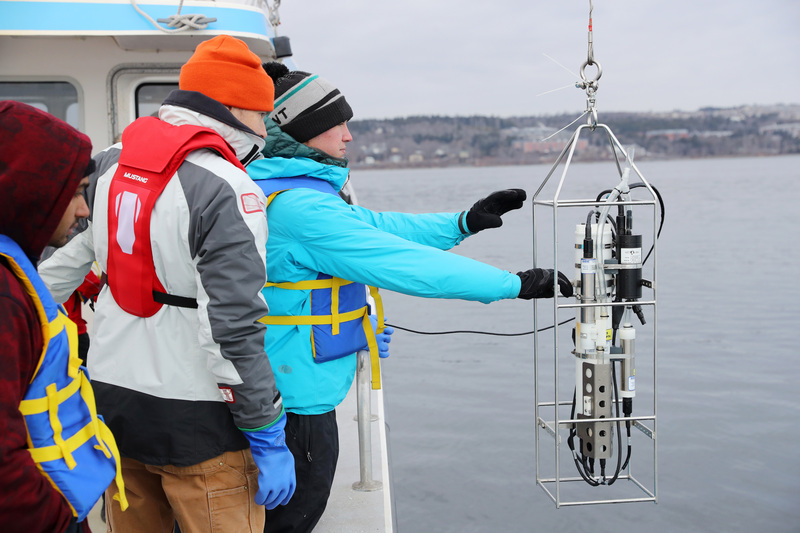 Field work will take place in the Bedford Basin to quantify sinking organic carbon fluxes shortly after the spring bloom in 2019. The observations will make use of the disequilibrium between a particle reactive daughter isotope and its conservative parent isotope (234Th vs 238U). Expected skills to be acquired: Analytical skills in geochemistry, isotope methods, field work (water sample chemistry, sediment core processing, isotope counting methods), better understanding of carbon cycling. Project title: Estimating particulate carbon on the Scotian Shelf from remotely-sensed particle back-scatter. Project description: Measurements of particle back-scatter made from ocean gliders operated by the Ocean Tracking Network (OTN) can be used to estimate particulate carbon concentrations in the water column. The conversion requires a locally-tuned model based on parallel measurements of both parameters. These samples will be collected over the Scotian Shelf and in Bedford Basin. The model will be refined to calculate phytoplankton carbon by developing a partitioning coefficient based on spectral light absorption by the phytoplankton and non-phytoplankton (detrital) constituents of the pool of particulate carbon. This will allow the glider data to be used to estimate phytoplankton biomass and (potentially) growth rates as they vary with the physical and chemical characteristics of the different water masses. Expected skills to be acquired: The project will involve field sampling, laboratory analysis of the samples collected in the field and modelling of the bio-optical and biochemical data. The candidate will get experience in deploying bio-optical instrument arrays in the field; lab-based calibrating and defining the operational ranges of the analytical instruments used to measure carbon, chlorophyll a, and spectral light absorption by phytoplankton and detritus; creating and using query-driven databases; and statistical analysis (linear regression, principal components analysis, ANOSIM). Project title: Tides, inertial oscillations and mean flow from ocean drifters along the Labrador coast. Project description: A set of six ocean drifters were deployed off the coast off Labrador in 2018 and have provided a novel record of ocean currents and sea surface temperatures in the inner shelf zone of that region. These measurements feature a simultaneous mix of tidal currents, inertial oscillations driven by transient winds (storms), and the background mean flow which is dominated by the southward flowing Labrador Current. This project will analyse these current speed measurements in order to separate and quantify the three components (tides, inertial, mean) from the record. In addition, there may be new data made available during the project, from deployments planned for the Summer of 2019. Expected skills to be acquired: Skills to be acquired will include computer programming (Python and/or MATLAB), understanding of large-scale and coastal ocean dynamics, and statistical analysis techniques. These skills will build on an existing background of undergraduate mathematics and physics that should be possessed by the student. Project title: Right whale research; Gulf of St Lawrence. Project description: Student will assist in at-sea monitoring (4 weeks) and oceanographic data and biological sample collections and will be involved in quantitative analyses of various oceanographic and whale monitoring data. Student entering 4th year with some sea-going experience and demonstrated quantitative and programming skills (Matlab, 'R' etc.) will have an advantage. Student will have an opportunity to further advance such skills and develop an Honours thesis based on some of the data collected.